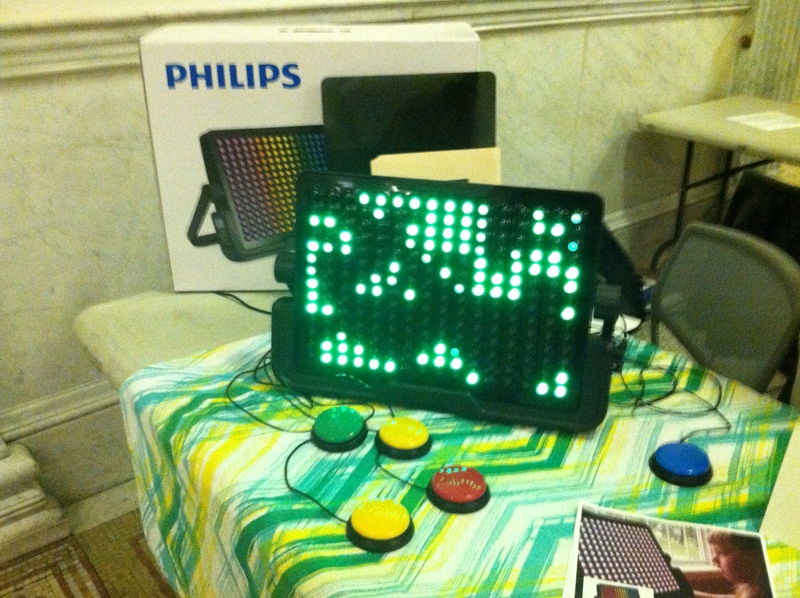 The Light Aide by Phillips is a learning device for those who are visually impaired. It uses individual pixels to construct images and letters in large print. Those who look a this device will notice it is similar to the light bright boards from back in the day. 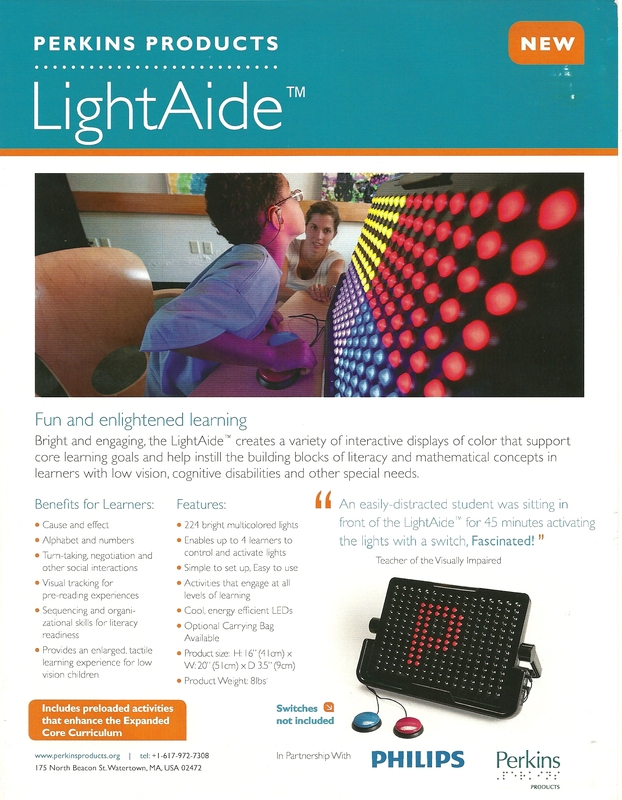 The device is very brightly lit and is a great tool for anyone with vision issues of all types. There are attachable buttons as seen below that can be programmed for various activities such as learning games or letter/number based tools. Additional games and tools can be added via a Flash Drive. I had a lot of fun playing around on this device and trying out all the different games. They even have Snake (for the kids who didn’t have the luxury of owning one of those old school Nokia phones, it was a small yet addictive game where you control a snake that moves around the screen and you have to make it larger by guiding it to small dots. The snake will get larger and you have to avoid crashing into the edge of the screen or yourself). Though the price is kind of hefty for those purchasing this device for home use, it is the perfect classroom tool for those looking to add such a device. You can find more information in the fact sheet below. Now for those who work with those with various disabilities and for those who have worked in any assistive technology professions, speech devices are one of the many crowning achievements in assitive tech. There are many disabilities that affect a person’s ability to form words and sentences with the most common ones being Autism Spectrum disorders and Apraxia of speech. Speech devices have been the key to giving people with such disabilities a new found voice to convey their thoughts. Two of the most popular stories of those on the Autism Spectrum who were given a new found voice through the use of speech devices are Carly Fleischmann who baffled doctors and therapists everywhere by utilizing a speech device to communicate her thoughts to the world. She has gone on to write a blog, go t college and is now an advocate for all on the spectrum. Naoki Higashida is a young Japanese youth who wrote the book “The Reason Why I Jump” which has been translated from Japanese into several languages world wide. 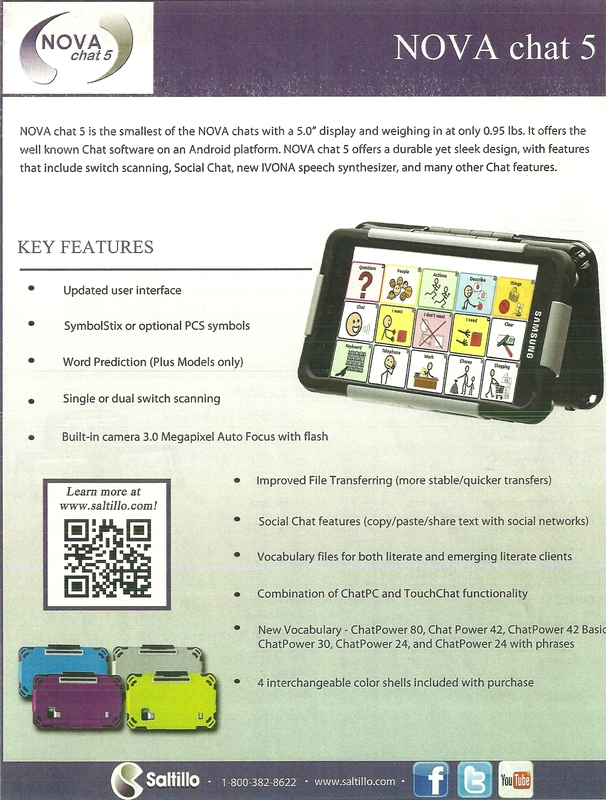 The Nova Chat can be downloaded as an app for the various iDevices with a few limitations or as a standalone modified android device in multiple screen sizes. The Nova chat has an expansive library of different verbs and nouns with word prediction for those who prefer to type out their words manually. With multiple screen sizes, there are many options to choose from for various situations and people. 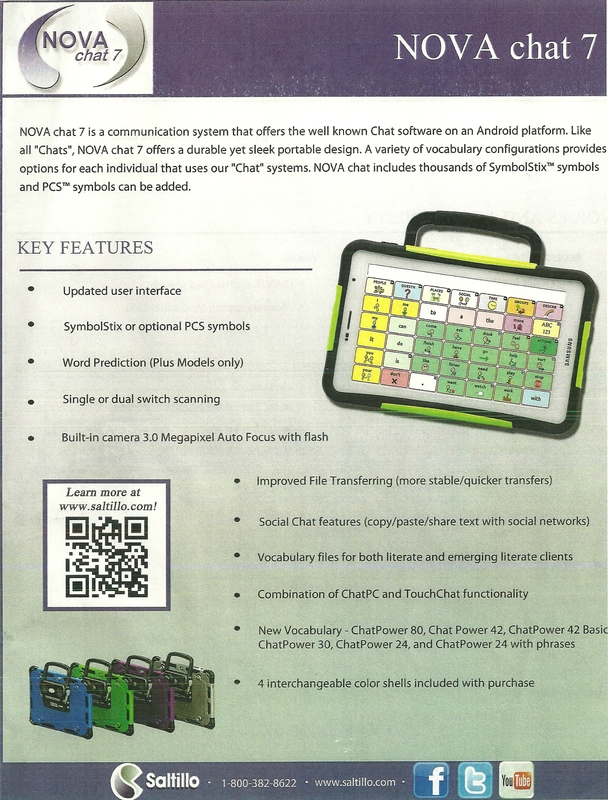 Whether you need one for the classroom or to have on the go, Nova Chat has a device for you. 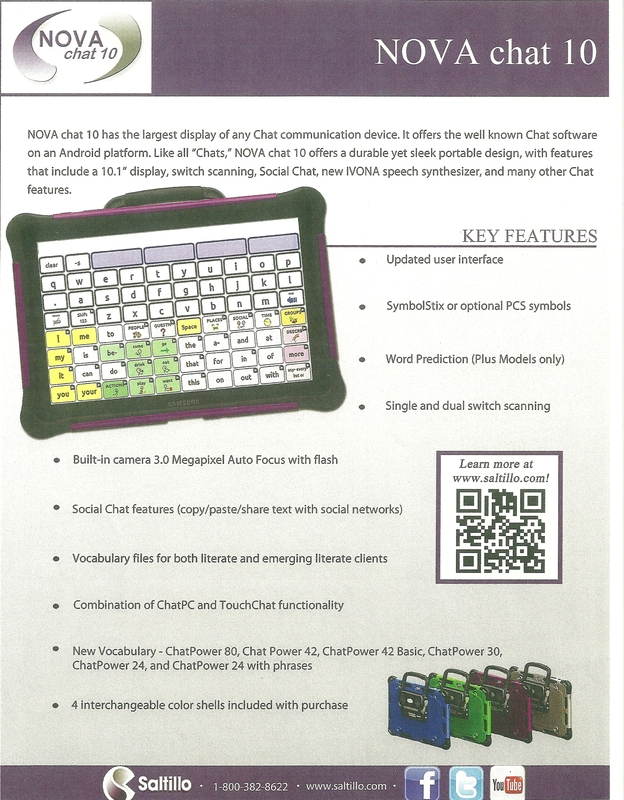 Below are facts sheets about each Nova Chat device. Now this one was my personal favorite. 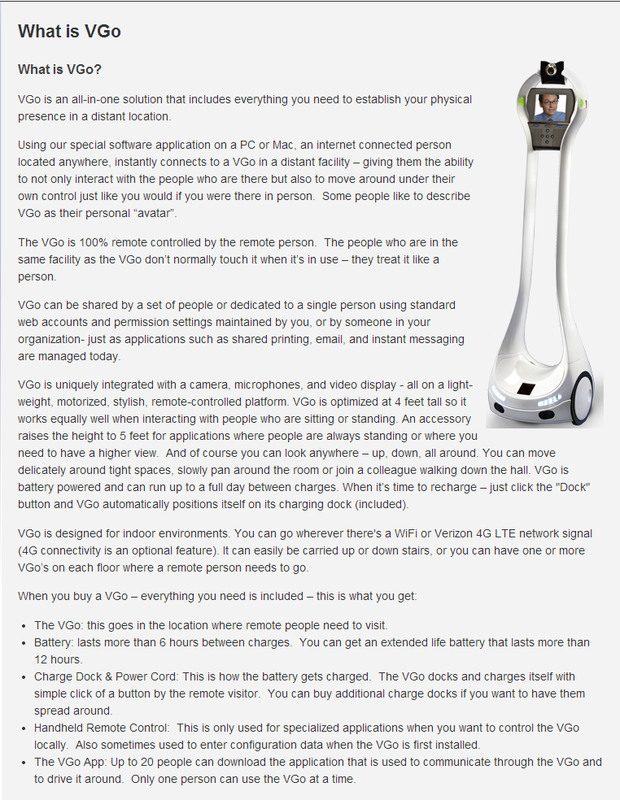 VGo is a company located in Nashua New Hampshire and if you watched a lot of football last year then you’ve seen this nifty little toy in commercials. This robot is controlled from a home computer over an internet connection and can broadcast the users face on the screen you see at the front. This robot is a really good tool for those who aren’t able to attend school due to any rehabilitation process that leaves them house or hospital bound. 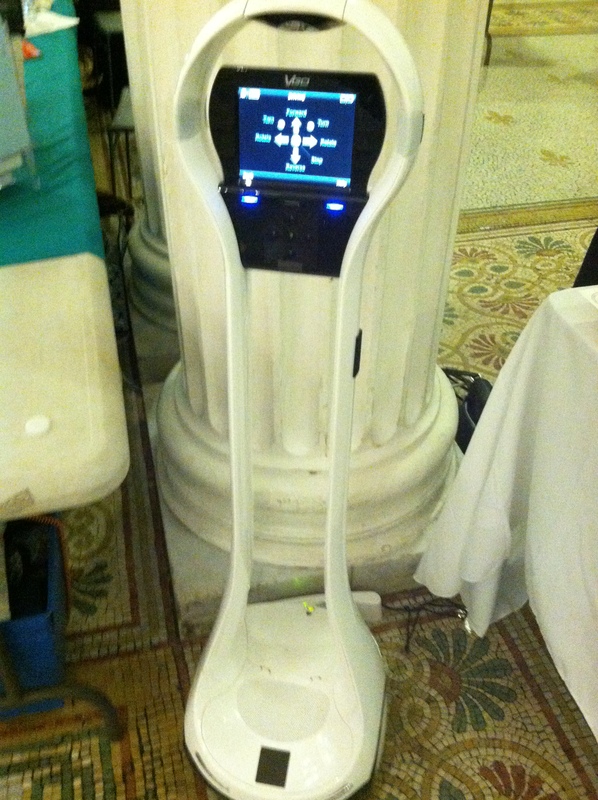 The Robot can be left in academic settings or offices as a way for people to virtually attend classes or meetings with the added option of mobility. Now I should note that this as awesome as this guy is, it is pretty expensive though I would hope this is something that can be covered by insurance though from experience with the process of obtaining assistive technologies, the process can be rather lengthy. In my opinion I believe the state should push to have a few of these in each school and every office should also have a few of these. Virtual attendance and mobility can eliminate many of the hurdles that came with having to be home/hospital bound during lengthy rehabilitation processes. For those looking for more info including specs you can find more info below. Now for those with vision issues, reading small print can be a real issue. Sure, magnifying glasses can be great but no one in today’s society would be caught dead walking around with one of those, unless you’re a much older person or just don’t want to drop the money needed to pay for something a bit more sophisticated with a nicer form factor. For those looking for something a bit more powerful yet can easily fit in to their wallets then this device is for you. Optelec vision devices include an LCD screen and a camera in the back that can magnify what ever text you’re looking at currently. The device also has the ability to convert all typed text on paper into a typed text that the device can read back to you using a technology call OCR (Original Character Recognition). 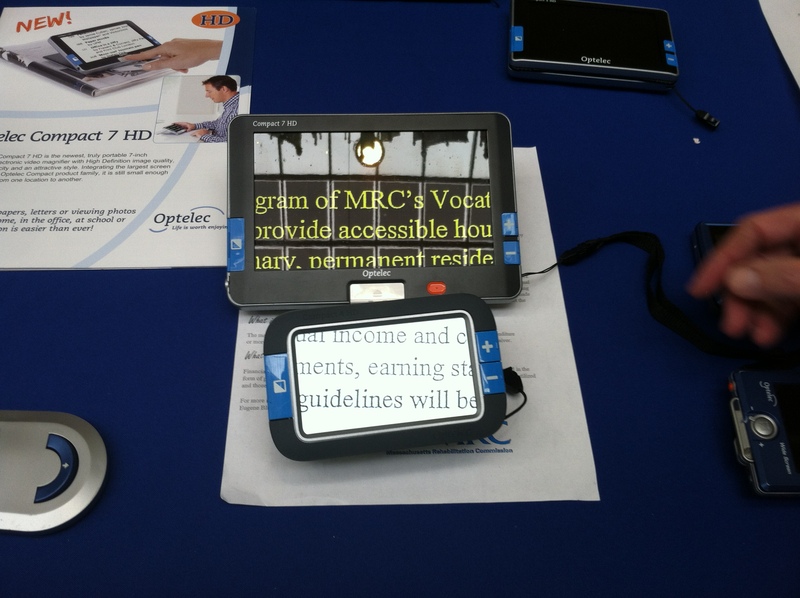 Now there are two variations of the Optelec vision devices, one for desktops and ones for when you’re on the go. In this blog I’ll be focusing on the portable ones. 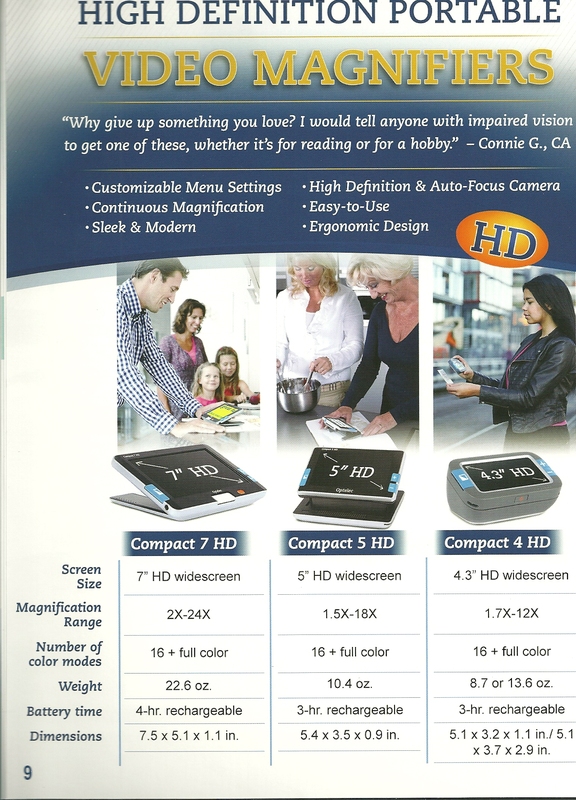 The portable devices come in multiple different screen sizes as seen in the facts sheet below. If you don’t feel like carrying a magnifying glass and you’re interest in splurging a bit of money then this device is for you. Now though on the surface this seems like a regular Microsoft device (pun intended in every way possible), this device is a reminder of the growing number of accessibility options for those using windows devices. 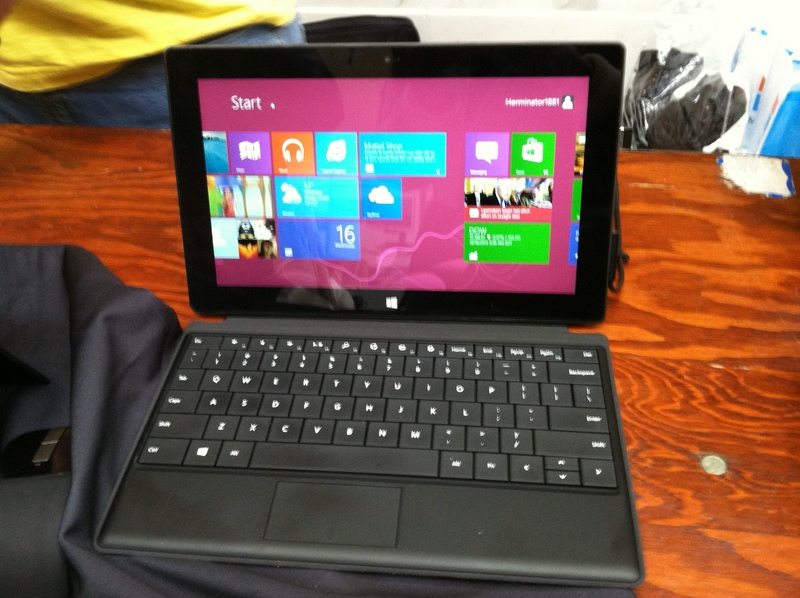 The Surface is Microsoft’s answer to the iPad and adds the additional option of an attachable keyboard cover which can be sold separately. Now tablets have been a Godsend in the assitive technology world as they add touch/gesture functionality to devices with out the sacrifice to portability. Touch functions have always been great for those who lack the fine motor skills to type using a keyboard. The addition of the keyboard cover for this device is great for those who do have the motor skills and want the precision that comes with an actual keyboard. What sets this devices part from Apple is that in addition to the cheaper model that includes the light weight version of Windows 8, there is a Pro option that allows people to have a full version of Windows 8 that will behave as if you installed it on your desktop. This a an even greater option for those who who want the form factor of a tablet without sacrificing the functionality that comes with an actual laptop. What ever device you get, it should also be noted that all windows operating systems new and old come with accessibility features called the Ease of Access options such as magnifiers and text to voice for those with low vision and voice to text for those who lack fine motor skills. Newer versions of Windows have been doing an awesome job of making these feature more noticeable than they have been in the past. Microsoft is somewhat new in this field but they are doing a great job of making themselves known and retrofitting their devices for users of all abilities. 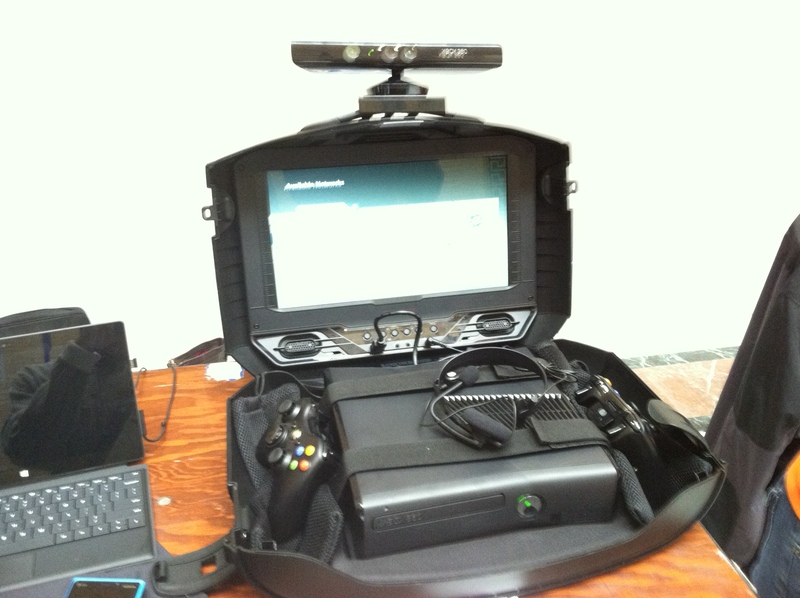 No this isn’t up here by accident, the Xbox 360 is your sixth device and was featured at this little gathering. Now those who aren’t techies or don’t follow video games are probably asking themselves “how the hell can the system known for angry thirteen year olds playing Call of Duty and Halo possibly be an assisstive technology?” Well people, your answers all lie with that little camera sitting on top of the device. For those who don’t know, this camera is called the Kinect, it is a camera that detects motion and in games it can be used as a full body remote for party games, dancing games, and a few action games. The camera can also accept voice commands and by waving your hand in the main menu of the system, you can bring up a cursor that can be controlled with your hand. Now I don’t know if Microsoft realized this, maybe they did but didn’t this as much as they should or maybe they just didn’t realize but Microsoft has built a VERY powerful piece of technology for those who have a hard time holding gaming controllers or other remotes. Microsoft has given those with impacted motor functions a way to navigate menus on their device. Though there aren’t many games that are compatible with this device as far as playing goes, the device will recognize voice commands no matter what you’re doing. The voice commands are where this device really shines for example, if you say Xbox and then “Go Home, the device will bring you back to the home screen and you can navigate menus of the device with your voice. hen in video applications like Netflix, Hulu, HBO Go, and several others, pausing, playing, and fast forwarding is as simple as saying it. You’d think including features like this in TVs, bluray/DVD players would be rocket science but you’d be surprised as to how few devices if any have such a feature without the need to add modifications. Now it should be noted that there are limitations to this device, though you can turn the device off with your voice commands, you cannot turn it back on without pressing the power button on the console itself or using the home button on the remote though the device is compatible with universal remotes due to the existence of an IR (Infrared Receiver). This generation of the two devices aren’t perfect and there are a few flaws but for those looking for a cost effective entry into this market, you can get this camera bundled with an Xbox 360 for $299. 1. Now before you say “but can’t you just get the new camera and use it on the older system”, it should be noted that this isn’t possible, this camera was tailor made for this new console and is molded into the newer console eco system. This newer camera will come with drastically improved voice controls and will instantly recognize your face as soon as you walk into a room. It will also recognize your voice and your voice only once it is on your profile and unlike it’s predecessor, the system can be turned on with your voice. 2. This new console isn’t a cable/satellite receiver but it can be pair with existing ones can will generate that guide based on the channel listing in your area. This feature works by passing the video signal of your receiver through a special port on the device and through pairing you can you your voice to change channels instantaneously. 3. You can also use your voice to navigate menus with your device just like the predecessor with the addition of brand new gestures for switching between apps, did I mention multitasking? The hand gestures will be perfect for those who have speech issues plus you will still have the cursor which you can move with your hand. 4. This new device will have a lot of the apps that were in it’s predecessor such as Netflix, Hulu, HBO Go, Vudu, and more to come in the future plus the addition of skype and an improved Internet explorer app and you will still be able to control all of these with your hands and voice. 5. The other thing this video doesn’t mention that was revealed until later in that conference is that this device is also a Bluray/DVD player. Hopefully after watching this video and reading the summary, $500 bucks doesn’t seem so bad for what this thing can do. 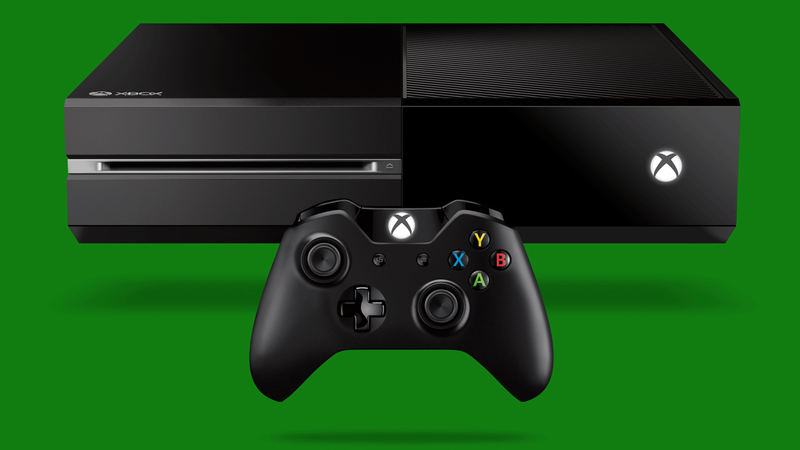 The word “One” in the name of this console alludes to its strengths as an all in one device. No more fumbling around to switch inputs after watching a movie or using netflix or any other streaming service in a player, everything is all in one place and can be easily access with just your voice. Words can not express how big of a deal this device will be for the disability community, this device will definitely set a standard for hands free accessibility in the living room that other devices will hopefully follow. Now it should be noted that Samsung’s newer Smart TVs do have some hand and voice gestures however, I find the cost of entry a bit too high at the moment for those who already have decent HDTVs and hopefully those prices will fall in the long run. If Microsoft can make the sell I just did to the demographic of those with various disabilities, they can go very far with this console and get themselves exposure in places they never realized they could. Hopefully one day we will get to a point when people who have physical disabilities or any disability that affects motor skills can have an option that will allow people to play games without the need of a controller. Once again it’s amazing how hard we’ve come with assitive technology and it will be interesting to see where we can go in the next few years. Hopefully when I have the money to get my hands on an Xbox One I will be more than glad to write a full review on the device and I will be able to truly say for myself if it will change the game but from what I saw in that video, I am a believer. Stay classy people. 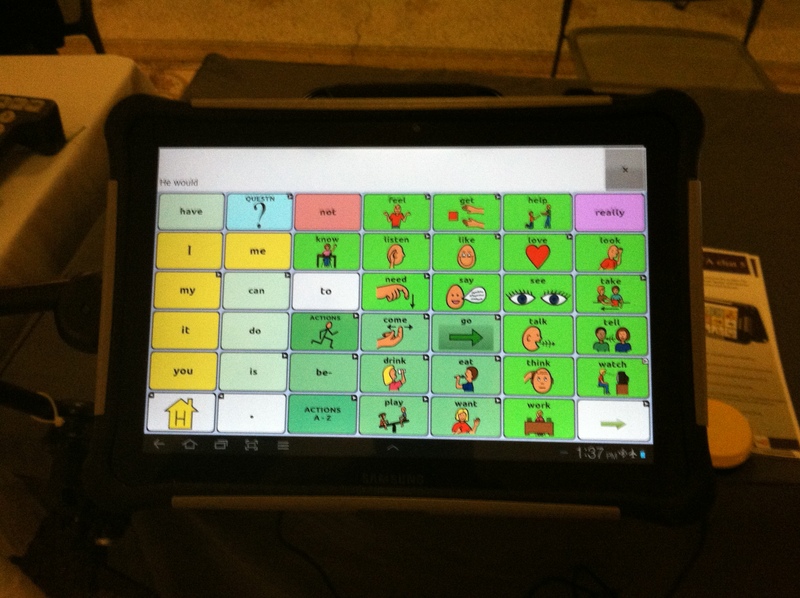 This entry was posted in Technology and tagged assistive technologies, assistive technology, Microsoft, microsoft surface, nova chat, opelect, phillips, vgo, windows, xbox 360, xbox one by flem0328. Bookmark the permalink. I’ve a project that I’m just now running on, and I have been on the look out for such info.